Suspension Bridge --bc. 1920, Lithograph. Edition not stated. Signed and titled in pencil. Signed in the stone, lower left. Image size 9 1/8 x 11 13/16 inches (232 x 300 mm); sheet size 10 13/16 x 13 7/16 inches (275 x 341 mm). A fine, rich impression, with margins (3/4 to 15/16 inch), on cream wove paper, in excellent condition. 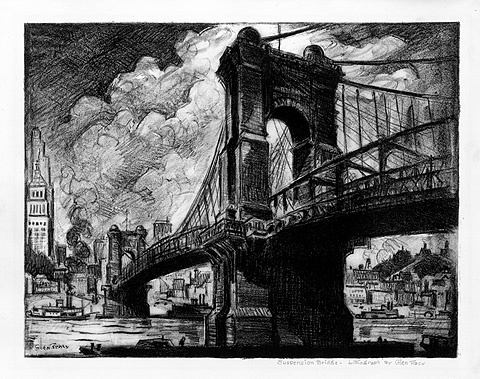 This lithograph depicts the Roebling Bridge in Cincinatti. J. A. Roebling was also the architect of the Brooklyn Bridge.